There have been quite a few metal bands that have survived the test of time but do not have the appreciation they deserve and Master is definitely one. Formed originally in Chicago (they are now in Czech Republic), they have been making death metal since 1983 a few years before Possessed or Death and impressingly enough they are still going strong today. Master started out slow, but in recent years they have been averaging a new album every other year. “The New Elite” is their eleventh full length album and they show no signs of slowing down. I absolutely loved “The New Elite”. My one and only complaint is that it's less than 45 minutes long. 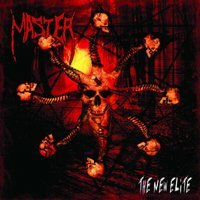 Master has proved themselves as an honest death metal band and this album is well produced and polished. If I had to sum up Master in one thought, it would be this: Sepultura if they were a death metal band. I recommend this CD to fans of Cancer, Obituary and Massacre. For those of us in North America we will have to wait until August 14th to get this album. Once you do, you may discover an aggression you never knew you had.